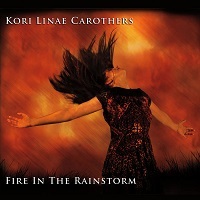 I would listen to Kori Linae Carother’s album just on the title alone...Fire In The Rainstorm. It is delightfully ambiguous. It is intriguing. It is impossible...or is it? I have listened to all of Kori's music and frankly, I thought her last album was her best, but she has proved me wrong. The degree of depth and maturity on this recording is remarkable. On Fire In The Rainstorm, Kori shares with us twelve wonderful tales, first account sightings and memorable impressions using contemporary solo piano. This is her everyday life set to music, and the music is profound. The album is dedicated to her daughter and as many know, having a child can bring to your life not only joy, but also perspective. A Day Like No Other, musically, is the witness to a little miracle. It is the rain in the garden, just paid all my bills, didn't forget my mom's birthday this year kind of day. It is the day you mark on the calendar of your heart and remember it forever. The melancholic melody of Time Passages is like looking into an old photo album. Some of the memories have curly edges and the cellophane tape has lost most of its power, while others maintain their vibrant colors and sharp images in our minds. There is nothing ambiguous in the title tune Fire In The Rainstorm. It is a thoughtful song, and to my ear, a song of gratitude. Our lives are full of contradictions, strife, and heartache. Once in awhile though, something happens or someone in your life gives you the nod or the smile or the hug just when you least expect it. It does not exactly call for a celebration, but under your breath, you say thank God. I really like winter music and I really like Winter's End. Kori gives the tune a warm, bright intro as if to signify the advent of spring. On the tallest mountains, the sun’s heat glows steady. The icy crust, what was once a heavy winter’s snow, transforms into life giving waters soon to nourish the green hiding just below the surface. The cycle begins again. Liberty is an upbeat tune with a definite cadence. It may be the sound of self-determination or celebrating the opening of a door long barred and forbidden. It could be the turning of a corner to get a new viewpoint or perhaps a major change in your life. In any case, this complex tune is one I will remember for the fluid, engaging melody. The Kindly Beast is a story for Claire, Kori's daughter. Some creatures hide under the bed or in the closet. Some peek through the window when the wind blows or some hide in your shadow. But not this one. This one plays in the sunshine, feeds the goldfish, and closes the bathroom door. He is a gentle guardian of a vivid imagination. You can replay these songs over and over as I did and discover fresh nuances with every turn. There is subtlety and craftsmanship in these tales. There is also a mother's heart embedded deeply in every note. Fire In The Rainstorm is Kori Linae Carothers tour de force, catering to those who love great piano music, and who always sleep with one eye open, and waiting to hear those tiny footsteps in the hallway.